Patient S. was locked in a room at Tiller’s abortion clinic against her will for four hours while a raging, life-threatening infection nearly took her life. Wichita, KS — An abortion complication landed a 23-year old patient of late-term abortionist George R. Tiller in the hospital last Thursday. The woman, who developed sepsis as a result of a botched procedure during a late-term abortion and suffered cardiac arrest, has come forward to tell of her harrowing near-death experience at Tiller’s Women’s Health Care Services. Patient S. had been under routine obstetrical care when she decided to abort her baby due to involvement in an abusive relationship. According to her last menstrual period and ultrasounds that she had received, she was 23 weeks pregnant at the time of her abortion, which she began on Tuesday, September 23, 2008. However, WHCS misdiagnosed her as being only 19 weeks – a difference of an entire month of gestation. According to Kansas law, at 22 weeks, a second physician must concur that the abortion is medically necessary. Patient S. never saw a second physician. Because she could not pay for the expensive abortion, Patient S. was asked to fill out forms, which included information about her race, so that she could have the abortion paid for by the National Abortion Federation and another fund that sponsors abortions for those who cannot afford them. Because Patient S. is an African-American, there was some concern that her abortion was covered by these funds because of her race. Abortionist Shelley Sella, a California abortionist employed part time at WHCS by Tiller, began the abortion on Patient. S. by giving her an injection digoxin into the abdomen, which is meant to stop the baby’s heart. Apparently something went wrong with the injection, because Patient S. began feeling sick. She was sent home for the day. Later that day, because she felt so badly, she went to the Wesley Medical Center emergency room for treatment. When it was discovered that she was a patient of George Tiller’s in the middle of an abortion, she was told to return to her own ObGyn, who informed her that the best thing for her to do was to go back to Tiller’s abortion clinic to complete the surgery. On Thursday, while shakey, sick, and running a fever of 103.7°, she returned to WHCS, where Tiller angrily confronted her about going to the hospital. He isolated her in a locked room for four hours, during which time her pleas to be let go were ignored. During this time, Patient S. was told that she should be quiet because she was upsetting the other women. She was told that unless her attitude changed, they would no longer treat her. She was also told that she would have to drive over three hours to a “Catholic Hospital” in Kansas City, Missouri, where her abortion would be completed. Patient S. Refused to make the trip and demanded that Tiller finish the procedure. Patient S.’s cousin, a man named L., arrived at WHCS and asked to see Patient S. but was refused. He sensed that something was wrong and began demanding to see his cousin. He was threatened with arrest and forcibly removed from the clinic by the security guard, who sprayed with a water hose in the parking lot. Patient S. observed that up until the time she was sedated for the removal of her baby that she felt movements in her womb. She informed Tiller’s staff that she had a high toleration for sedation, but was ignored. Attempts at sedation proved ineffective. While she was supposed to have been sedated, she heard comments made by the staff that led her to believe that something was terribly wrong. She remembered fearing for her life and suspected that they may try to kill her while she was under sedation by overdosing her. Once the staff realized that she could hear them, they stopped their conversation and fully sedated her. The mother was present during the removal of the baby, and observed Tiller inserting a tube into the back of the baby’s skull and vacuuming out the brains. 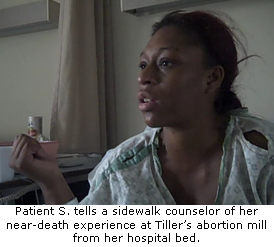 This disturbed her so greatly that she told pro-lifers that she could not sleep for three days because of what she saw. The abortion described by Patient S.’s mother is also referred to as a “partial birth abortion,” which has been banned both by the state and Federal governments, if done on a live baby. If Patient S. baby was alive at the time of the delivery, as she believes, then her abortion would have been an illegal one. During the procedure, Patient S. suffered an asthma attack and cardiac arrest. She was revived after being given epinephrine and other measures. Instead of calling an ambulance, Tiller told Patient S. was told to hold her I.V. bags, while he drove her to Wesley Medical Center in his personal Jeep. During the short drive to the hospital, Patient S. feared several times that they would get into a car accident since Tiller did not seem to be able to see very well, and was verbally directed though traffic by a female employee who was in the back seat. Once at Wesley, Patient S. bypassed both the emergency room and admissions and was taken by Tiller directly to a private room. She was given a course of antibiotics and discharged from the hospital on Saturday, September 27, 2008, even though she was still in pain and feeling sick from her ordeal. Patient S.’s experience closely resembles that of 19-year old Christin Gilbert, who died from untreated sepsis during a third-trimester abortion at WHCS on January 13, 2005. Abortionist Shelley Sella, the abortionist who began Patient S.’s abortion, was involved in the abortion of Michelle Armesto-Berge, where she is also accused of botching the digoxin injection. In addition, Sella was accused by a former Tiller nurse of having stabbed to death a baby born alive during a late-term abortion at WHCS in 2007.